One of the smallest tomato seedlings that went into the Tomato Bed didn't survive. There were still some spare seedlings remaining in the nursery. The largest was chosen for transplanting. When the original plantings were done the weather was overcast for a number of days making it excellent timing. However the weather this time was quite warm. 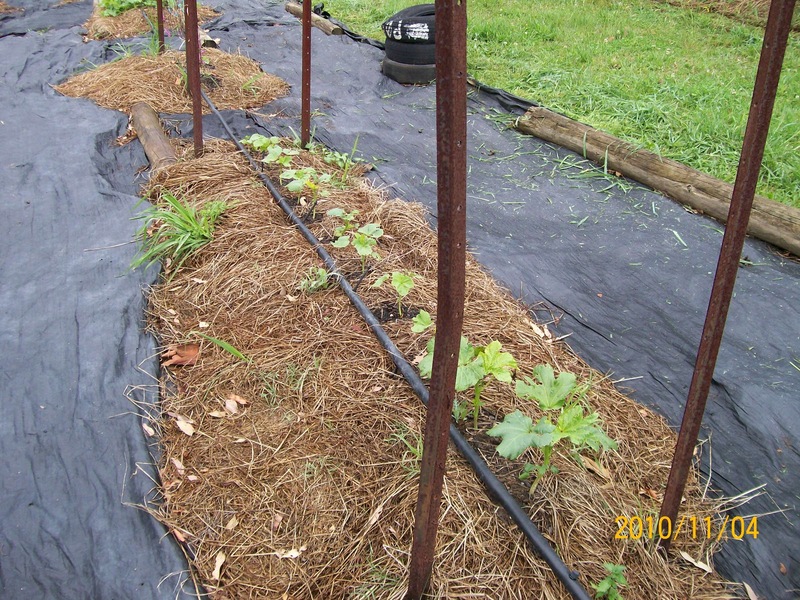 To reduce the risk of withering from the heat about half the foliage was pulled off once the seedling was in the ground. This has been a successful process in the past and there was no disappointment this time. Had the weather been even hotter it would have required the additional placement of a small pot over the seedling from mid morning to mid afternoon for the first week. This is a useful tip if planting in the hotter months. The garden is producing a good quantity of Peas and Broad Beans. Both these can be transformed into a bruschetta. The Broad Beans steamed until soft have olive oil added with some finely chopped garlic, pepper, salt and some finely grated parmesan cheese, then smeared on toast. A similar process can be followed with the peas, but using only finely sliced leeks or onions which are cooked in olive oil until quite soft. When on the lookout for alternative uses for seasonal produce it’s quite amazing how often recipes include ingredients which are not grown in that season. This is fine for the city dweller who can attend the nearest supermarket and choose any combination of fruits and vegetables. These recipes are unhelpful to anyone aiming at self sufficiency or buying produce from the local farmers market. The worst aspect is that it encourages vendors to source products from long distances rather than supporting the local growers. It would be more thoughtful if food writers were more aware of these unseasonal combinations. 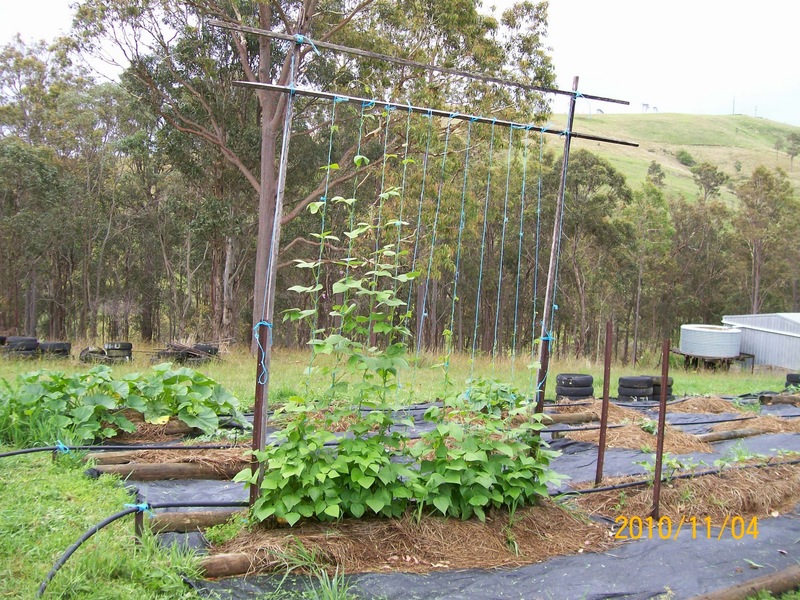 Both the peas and broad bean plants are getting to the end of production but the timing isn't too bad as the climbing beans are over 2 metres tall now and small flower buds have appeared. If all goes well there should be a beautiful transition in the next month. It doesn't matter how hard we try, its feast or famine with different vegetables. At the moment the self sown Fennel is prolific, the Silver beet ,although nearing the end, is still formidable. Parsley has gone to seed but some self sown plants have popped up elsewhere. Last year we were scratching around to get a meal from the podded peas yet this year it has been full on. Maybe one day we will be like the TV gardeners and have everything orderly, copious and in good health. undercover storage. When gluts like these arise its very satisfying to be able to take advantage of them and put in place a little future proofing. 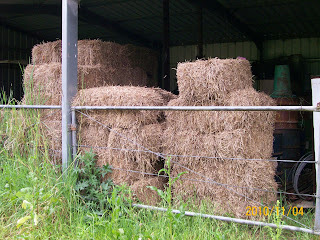 After unloading and storing the bales there was a deep sense of wellbeing in the knowledge that we were ahead. Our local council library works in conjunction with a number of neighbouring council libraries. They have combined forces and share a common catalogue. The catalogue is also available online to any library member. Any books, CDs or DVDs can be requested online and the item will be forwarded to the library branch of your choosing. When finished with it can be dropped at any of the participating branches. If an item is in great demand such as a recently published best seller then the system assigns a number in the queue. You can track your progress in the queue online and you are automatically notified by email or text message when the item is available at your requested collection point. All this is available for just a miniscule fee for each item. With the continual publicity about logging forests it’s surprising to see how much timber goes to waste. Not all timber pallets are reused, most which are used to carry products from overseas are thrown away or burnt. 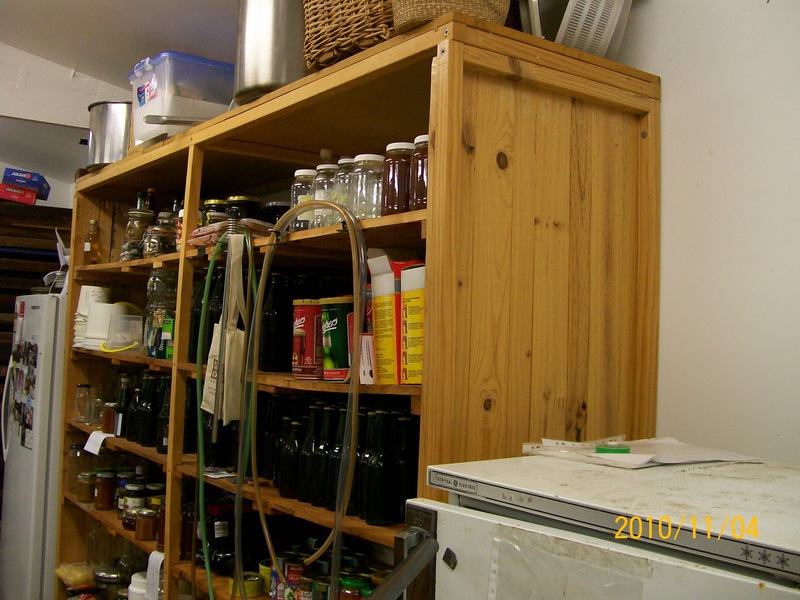 When we were building an over sized pantry to store bulk supplies in our shed we chose to use pallet timber in its construction. The pallets came from a heavy machinery parts importer and a tile importer not all that far away. They were pleased to give them away as an alternative to paying to have them dumped. After collecting a couple of trailer loads it was just a matter of knocking them apart and removing the nails and stacking like sized pieces together. There is some wastage as this isn't first grade cabinet timber and can split. But those broken pieces make excellent starting sticks for next winter’s fire. An ordinary electric planer can be used to remove the roughness. Obviously if you have a planer/thicknessor you can achieve an A grade result. We went for the more rustic look but the design incorporated strengthening to cater for the load the shelving would carry. 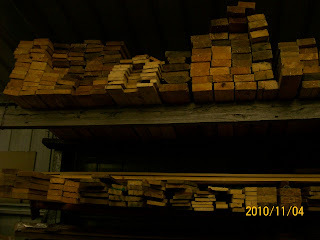 Since then we have collected a number of additional loads of pallets and store the recovered wood for future projects. They have been a real bonus in the workshop for all manner of projects. The only thing to be aware of is to avoid any of the pallets made from chemically treated wood. Fortunately most soft and hardwood pallets from overseas are heat treated for sterilisation. We plant about 10-12 Okra plants every Spring. By Summer they are producing enough every few days to provide a great little nibble with drinks. They are best when small and tender about 50-80 mm in length. From experience Clemsons Spineless are the easiest to grow. The simplest preparation is to fry them in a covered pan with some olive oil until tender then drizzle a little soy sauce or even salad dressing over them then serve. They go well with a beer of wine. The plants will provide an ongoing supply well into Autumn. 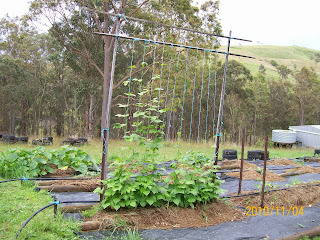 Last year the plants must have been very well fed as they grew well over 2 metres tall. A few pods left to mature will yield more than enough seeds for the following year. In February this year we were lucky enough to be able to buy and harvest grapes for our own wine making. With the reds no preservative is used. In the case of Shiraz it was destemmed and crushed with 10% of the stems being returned to the fermenter. The stems are a good source of tannins but too many can detract from the flavour; while the pips and skins are a good source of polyphenols. The pH level was adjusted slightly with Tartaric Acid and one third of the required yeast nutrient added. The remaining yeast nutrient would be added in two further instalments as the sugar level dropped. If the pH is too high the wines can taste flabby and be more susceptible to spoilage. Yeast nutrient ensures the yeast gets a good start and reduces the possibility of a stuck fermentation by ensuring there is sufficient Nitrogen for the yeast to reproduce. The temperature was lowered to 15 degrees C and the must was inoculated with purchased yeast, the yeast having been rehydrated and acclimatised to the low temperature. The lower the temperature the slower the ferment and the longer the skins and pips remain in contact with the juice. The longer the contact the greater the extraction of polyphenolic compounds such as procyanidins which provide the antioxidant health giving benefits. The next morning 5 litres was bled off to make a small quantity of Rose. The temperature was maintained between 10 and 16 degrees for 9 days until two thirds of the sugar had fermented. 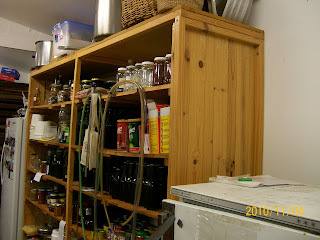 The temperature is managed by having the fermenter inside an old freezer which is regulated with a timer. The timer being adjusted as needed to accommodate the changing intensity of the fermentation. Over the few weeks of vintage each year our electricity bill skyrockets as we run up to 6 recycled refrigerators and freezers to keep the different batches cool. In addition we run an air conditioner to keep them cool. Well good wine does require some sacrifices. Because no preservative is used it is important to get the juice under airlock before fermentation finished. Consequently, once two thirds of the sugar is consumed the must is pressed and loaded into demijohns to finish fermenting under airlock. This is also a good time to add oak chips to enhance the flavour profile. As the fermentation eases and finishes the demijohn is topped up as needed to minimise the air pocket. Of late we have avoided racking the wine and therefore any potential oxidisation. 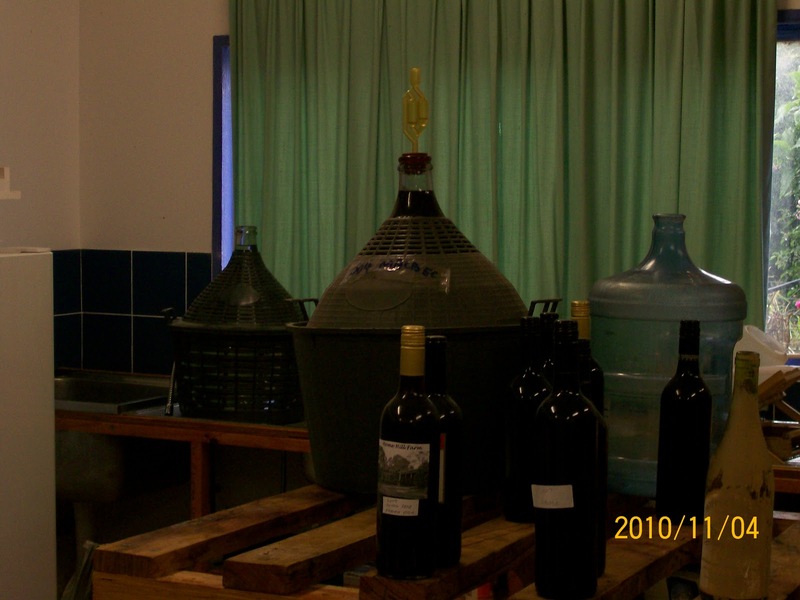 The wine is usually bottled within 6 to 9 months. There will be a lot of bottle sediment but that is of no account as it is easily decanted. In the past we have racked between one and three times before bottling but of recent times the move has been to less and less handling and letting the wine develop its own style. Based on the Specific Gravity measurements, this Shiraz should come in at about 13% alcohol. Only 25 litres was produced as we also had a good quantity of Merlot and Malbec. We put aside one dozen in the cellar to observe how it develops and ages over time; the remainder will be consumed over the next 12 months or shared with friends. As we have still some bottles requiring corks, some is bottled with recycled corks and the remainder under screw top. We are lucky that the fruit has been of superb quality which makes the wine making a breeze. When the fruit is faultless the winemaking skills can be minimal. It has been said that the worst a winemaker can do in those circumstances is interfere too much and make a hash of the end product. Only one demijohn remains and it has 34 litres of Malbec which should be bottled next month. Bottling on a descending moon ensures the clarity is much improved, as we've found . Every year is in itself an experiment, as different ripening conditions take place. In addition, we try a variety of experiments such as wild yeast ferments, varying the temperature at different times during fermentation, quantity of stems in the ferment, timing and quantity of oak chips. Lots of notes are kept with each batch. 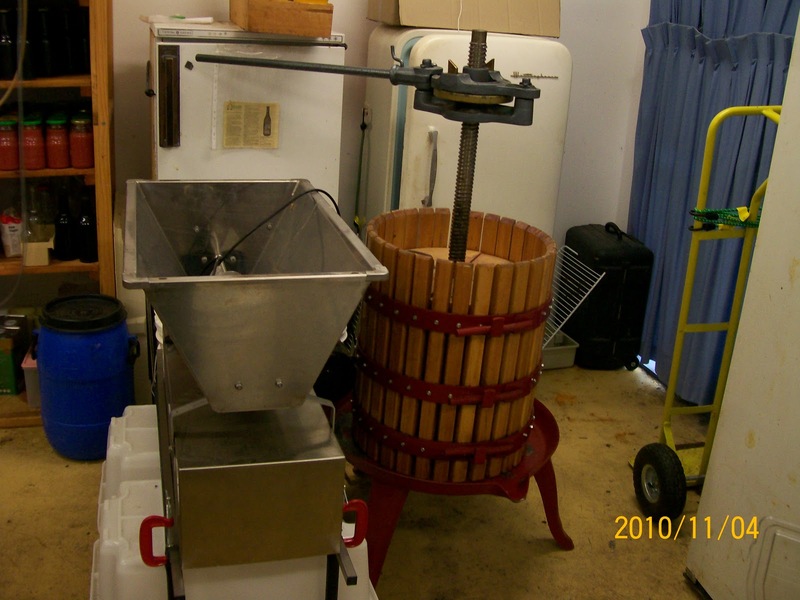 Apart from failing to make a successful white wine without at least 50 parts per million preservative (compared to anything up to 200 ppm in commercial wine), all the batches have been very good or at worst acceptable. But then, when it is of your own making, there is a greater level of tolerance.